The Best Dog Crate For Every Nes: Home Use, Training, Travel or Just A Nap! All sizes plus Crate Covers, and Airline Approved Crates. For Your Needs, And Your Dog's Of Course! Before selecting the best dog crate for your dog, think about the main purpose your want it to serve because crates are designed to suit a variety of needs. For example, a crate can be used for a dog's bed or refuge around the house or his outdoor shelter. This may be different to one you would choose for houstraining, travel, or camping trips. Air travel is a very specific need, whether you are shipping your dog due to a move, or flying with him on vacation. Airlines have certain crate features and requirements to be aware of that must be met for air travel. Other important factors are the age and size of your dog. If you get your dog when he is a fully grown adult - possibly a rescue - his needs and your purpose could be considerably different to that of a new puppy. The material strength of a crate may also influence your choice depending on whether you have a great escape artist or a mellow muffin who would be secure in a soft dog crate. Popular options for pet parents after their dog is past the puppy stage and well-trained, are attractive furniture crates that will fit in with the decor of the living room. Once you find the best dog crate for your needs you'll wonder how you ever got along without one. Aside from the explicit safety aspects of traveling by car or on an airline, a dog crate can serve many other purposes. Take for instance transporting your dog to the vet, which can be very traumatic for a pet - especially one that is experiencing some level of distress. But once your pet is used to popping in and out of around the house, he will be less fearful when traveling in one to the vet, the groomer, on a road trip, on a plane etc. On this page you will find dog travel crates and carriers including ones that are airline approved as well as a selection of multi purpose pet carriers to consider for your dog's hangout, or for the more specific purpose of crate training a puppy. dog is flying with you just to make sure the regulations haven't been changed. For your convenience we have included a video further down the page that tells how to prepare crates to meet airline regulations. When sizing for your dog, measure him standing upright to the top of his head. You want to make sure that he can stand up without touching the top of the crate and also lie down comfortably. This travel pet carrier is one of the best dog crates for all modes of transportation or as an in-home den. Made from durable plastic with interior "stay dry" moat and secure metal bolts including wingnuts. Very quick assembly. Ideally suited for for small dogs or cats up to 14 inches tall or weighing up to 15 pounds, the crate has lots of ventilation including both rear and side vents to keep your pet comfortable and calm. Petmate indicates the crate will meet cargo requirements for most major airlines. Measures 21L x 16W x 15H inches. Other color and sizing options available. Giant dog crate - best dog crate for very large dogs such as St. Bernards, Newfoundlands, Bullmastiffs, Doberman Pinschers, and Irish setters. Heavy-duty airline approved plastic crate with plastic wingnuts that won’t corrode. Plenty of cool ventilation. Made in the USA. 1-yr warranty. Measures 48L x 32W x 35H inches. This extra large dog crate made in the USA is one of the best crates for very large dogs up to 29 inches tall and weighing between 70-90 lbs., such as Great Danes, Greyhounds, Newfoundlands, St. Bernards, and Bull Mastiffs. 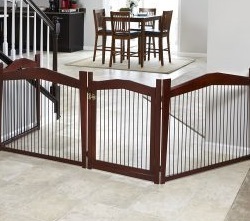 Durable construction, with ventilation on three sides and secure steel door. Approved by most airlines for air cargo travel, but check to be sure as requirements sometimes change..
Crate measures 39L x 26W x 30H inches. Plastic dog crates, such as this one, are popular for keeping large pets safe and comfortable. Designed to house dogs between 90-125 lbs, the X-large, Petmate Ultra Vari kennel is vented on three sides plus the door and approved by most airlines for international cargo shipping. The crate is made from heavy duty eco-friendly plastic with strong wire doors and vents, and is secured with non-corrosive wing nuts. It's Easy to assemble and clean and comes with a five-year warranty protecting Rover's headquarters! Crate measures 48L x 32W x 35H inches. As a rule, dogs adapt to crates quite easily because they provide a feeling of security. While no one really knows if dogs have a denning instinct left over from way back when their mothers built dens for birthing, we do know that dogs seem to be drawn to small dark and quiet areas of their homes. Nowadays, crates often become such a place when things get hectic, as well as just a cozy place to take a nap. Attractive large two-tone portable travel crate with four wheels. The is another plastic crate with ventilation on all sides for your dog's safety and comfort. It is built with durable plastic and has a secure steel front door. Meets USDA and IATA requirements for shipping live animals. Suitable for pets weighing up to 70 pounds. Ruff Maxx Portable Dog Kennel with a range of sizes to suit medium to large breed dogs, weighing from 30 to 90 pounds. Approved for domestic and international air travel. Durable reinforced plastic with secure door lock, well-ventilated and comfortable. Easy assembly. Petmate airline approved Sky Kennel made in the USA. Several sizes available. Meets requirements of most airlines, but best to double check with your chosen carrier. Crate is made of high strength plastic with a metal gate and is easily assembled. Comes with "Live Animal" labels, identification stickers, an absorbent pad and food and water cups. Petmate Vari Kennel Intermediate Size. Most up-to-date design methods used in construction. Airline approved dog travel crate, but always double check with your chosen carrier. Vents on sides and rear. Very stylish, no tool assembly, completely secure with tie-down strap holes for additional security during air travel. Made in the USA. Meets USDA and IATA requirements for shipping live animals. Well-ventilated, Petmate Vari Kennel. High quality, heavy duty kennel fasteners and a secure locking door. Suitable for dogs up to 25-26" tall. Pink and Black Fashion Crate - Two sizes, for dogs up to 10 pounds and dogs 10-20 pounds. Versatile design with a front door that can be opened from either side. Made from sturdy high-impact hard plastic, yet light in weight for good all around transport, plus it's airline approved to meet USDA and IATA regs. Secure door latches and excellent ventilation for your pet's comfort and visibility. Very easy to clean and assemble. Small Dog Crate. Travel by road or fly the skies with your pet in this crate that meets IATA and USDA standards. A slide and snap design for no tools easy assembly. It's lightweight yet sturdy and has plenty of ventilation on all sides. The crate must allow sufficient room for the dog to stand completely upright without touching the top of the crate, turn around easily and lie down in the normal manner with no restrictions. The container must be strong enough to protect the pet during transport, be secure enough to contain it and have sufficient ventilation on all four sides, to ensure the air quality in the container will not deteriorate. The door must be secured in such a manner that it will not open accidentally or the pet cannot open it during handling and transport. The pet's nose and paws should not be able to fit through any ventilation opening or door mesh. The container must have food and water dishes accessible from the outside. 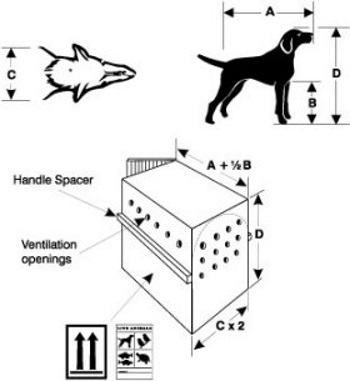 The image below is a guide from the IATA website to assist you in measuring your pet for a crate. Note: If your dog has erect ears, measure to the top of his ears to calculate "D". Once you have selected your dog's travel crate, the video below provides step-by-step instructions on what you'll need to do to prepare it for the flight. A selection of crates suitable for car travel, around town trips, easily portable for vet visits, in-the-home decorative, as Fido's private den, or for crate training purposes. There are also some attractive crate cover sets. Life Stages Dog Crate is our choice for best metal dog crate and one of the most popular dog crates available. This foldable wire crate made by Midwest comes with a divider and is one of the top choices for crate training a puppy. The divider lets you adjust the size as your puppy grows while ensuring that there is too much excess room for him to soil his space. Double doors allow access from two sides. Completely portable for moving around the home or for travel - folds up neatly when you're ready to go. Removable pan makes cleaning a breeze. Best Folding dog crate for use both in the home and outdoor road travel use. The Port-A-Crate while being a soft sided dog crate, still has an extra strong steel frame which supports its tightly woven fabric cover. Mesh windows on all sides provide flow-through air circulation. Sets up and folds away for storage in a matter of minutes. No tools needed. A beautiful crate that doubles as a piece of fine furniture. Made with sustainable hardwood, expert construction and designer styling, this dog crate is one you'll be proud to have in any room of your home. The crate has good ventilation on all sides and a waterproof interior floor for easy maintenance. It is available in two finishes - espresso or mahogany, and in sizes to accommodate small to large dogs. The front door can be left off if preferred. Wicker Dog Crate. An attractive crate in dark brown wicker with raised non-slip feet to keep it above the floor plus an interior pan for unexpected accidents. The exterior door can be left open or securely latched inside and out of the way - a clever design feature! This crate will add a smart touch to any room of the home. The wicker material does not absorb fluids or odors and cleans with soap and water. Easy assembly and available in several sizes. A stylish solid wood veneer pet crate, smart enough to be placed alongside a couch as an end table. The innovative design features a hinged front door that can be closed and latched, or slid inside and completely out of sight as desired. Metal rod construction provides durability to the crate and the top surface has a weight capacity of 300 pounds. Available with a black or white finish. An innovative 2 in 1 pet crate comprised of four panels and a top that can be transformed into various gate configurations as needed around the home. The attractively styled crate will complement your home decor and is constructed of solid wood veneer with metal support and an interior removable plastic tray for easy maintenance. The top surface is sturdy and is ideal for decorative accessories such as lamps and vases. No tools are required for the easy assembly. Sizes: Medium - 32.5L x 23.5W x 22.5H in. Large - 40L x 28W x 31.5H in. 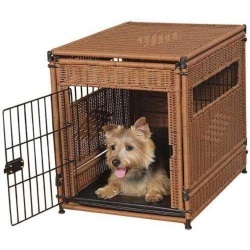 Attractive Wicker Dog Crate for your small dog. This designer dog crate looks so good you can proudly put it in your living room! Removable rugged plastic pan for easy cleaning plus door with spring-loaded door latch. Great Dog Carrier/Den - 36" size with double door convenience. Heavy duty yet lightweight wire crate for home or travel. Easy set up and collapses for storage. Leakproof pan. Suitable for dogs up to 70 lbs. And to make this crate more cozy and private, check out some of the attractive crate covers at the bottom of this page. Soft crate for indoor/outdoor use. Ideal for road trips and sets up in a minute, plus your pet will enjoy exceptional comfort on the ride. Constructed with a rugged steel frame and long-lasting durable canvas shell. Includes a supportive removable and washable mat, plus roll-up window and door covers for ventilation control. Stylish Portable Tent Dog Crate. Very quick assembly - useful for indoors or out. Durable and easy to clean. Weather resistant material. Comfy faux sheepskin interior pad. Zip mesh door. Great for road trips - assembles in minutes. Very often a pet will be appreciative of a dog crate cover or a set for added warmth, more privacy and the added feeling of security. This could make the difference in a puppy settling down in your bedroom at night, or a dog feeling more secure on a car trip. Sweet Safari 2-piece crate cover set is made of machine-washable polyester and includes cover and interior bed. Large 3-piece Crate Cover Set made from washable cosy Plush material. Includes Cover, mattress, and interior bumpers. More colors and sizes available. A unique insulated heavy duty dog crate cover for extra pet warmth - just like a jacket for his crate. Storage compartments on the side and tie down rings come in handy for travel and the window coverings can be detached during summer months. This strong and durable cover comes in four sizes. Chic and modern, chevron patterned crate cover. Designed to fit most standard single or double door crates. Additional fabrics to choose from. High quality stylish crate cover you and your dog will be proud to show off. Roll-up panels allow entrance/exit from both sides. All machine washable and dryable. Create a low stress environment for your dog. Size: 48x30x33" fits extra large dog crates. We hope this page has been helpful to you in finding your Best Dog Crate as well as a dog crate cover if needed. To your dog's happy life!